Cool weekend event alert! 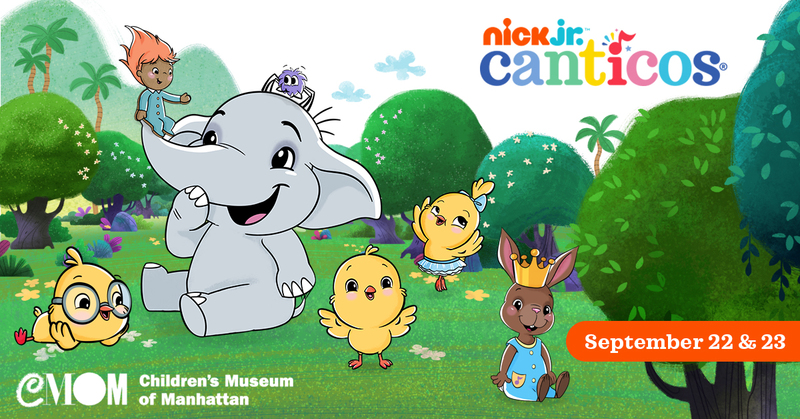 During a special weekend of programs at the Children’s Museum of Manhattan, kids and their families will have the opportunity to sing, play and learn with Canticos – a collection of bilingual classic nursery rhymes and songs from across the Spanish-speaking world brought to life through books, apps and sing-along videos that are available on NickJr.com. This will include the chance to learnCanticos’ Little Chickies – Ricky, Nicky and Kiki – along with Sammy the bunny and Benji the elephant and his pal Lili the spider. They will also meet Canticos creator Susie Jaramillos for book readings, sing-alongs, and arts and crafts. Join artist and Canticos creator Susie Jaramillo as she shares her favorite Canticos nursery rhymes and songs. Sing-along with Susie and learn about her journey creating memorable characters, books and cartoons. Come check out the adorable world of the Canticos characters with sing-along videos in English and Spanish! Ricky Chickie is an adorable little chickie who loves a good snuggle. Come meet him, get a big hug and even take a photo with Ricky. Get creative with Canticos! Find inspiration from the Canticos cast of characters and their stories to leave your mark in the Children’s Museum’s latest exhibit, Art, Artists & You.